Oh my, look how much our lavender has grown since we planted it! Juuuust kidding. When we planted the three little lavender plants they were quite pathetic looking already, but at least they were green and alive looking (See photo). Within a week all three plants shriveled up even more and turned into brown leafed and dead looking plants. Maybe we were a little fast with our decision, but we decided to tear them out and replaced them with some grown plants that we purchased at a local garden center. 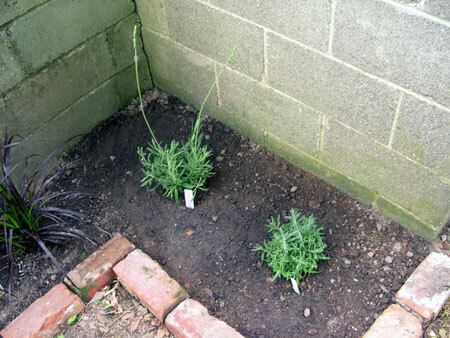 The one on the left is called “sweet” lavender, the one on the right is called “hidcote” lavender. Peeking in on the left is also some “red fountain grass” that we planted. Atlanta has had a drought (already, and it’s not even summer yet!) 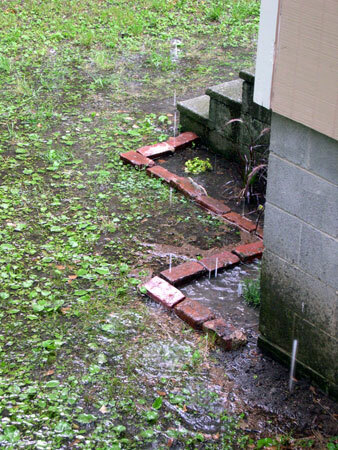 with some 10 inch rainwater deficit. We haven’t had a good downpour since we started planting. 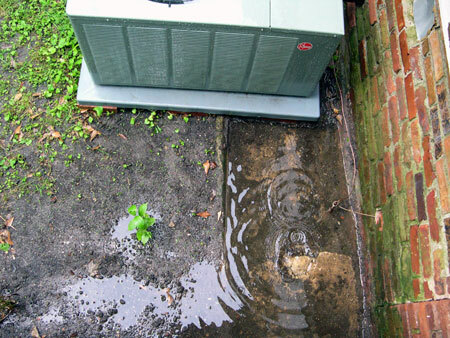 We knew that there was some flooding in the area by the back steps because when the laundry extension was built they did not bother to calculate in the drain run that was going along the house. So now the water accumulates in a giant puddle (actually it looks close to a pond with the weeds in there! ), including in our new flower bed. Everywhere I have read about lavender it says that the plants like very rough conditions, which includes dry soil and full on sun. With the standing water after a downpour I’m a little scared the lavender won’t be very happy in that place – I guess we’ll have to see how it grows or doesn’t. On the other side of the stairs we recently dug up the lost drain that is now blocked by the laundry addition. With the soil gone, or perhaps we just haven’t paid as much attention before when it poured, there seems to be quite a lake. The itty bitty green plant in the middle is a “weigela carnaval” that we planted there in hopes for it to grow large and hide our monster of an A/C unit. While we’re busy enough trying to keep up with our own house and garden we have also had to tackle the neighbor’s yard. 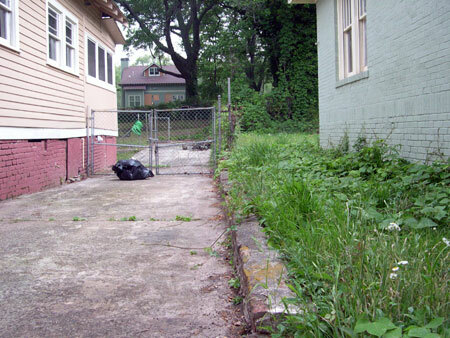 A while ago it started off with one kudzu plant starting to creep up the side of their house. It was actually quite crazy to watch because I was able to literally count it going up one brick a day. Eventually the lawn mowing service came out and cut it down. But since then they haven’t come back and the lonely kudzu plant amidst the grass has turned into some grass plants amidst a kudzu field. And those little buggers just loooove to grow onto our driveway. And over our backyard fence for that matter. Since they say kudzu grows up to a foot a day (!) I have been going out there every few days to cut the plants that started coming onto our side. It’s really quite annoying. So the other day we had some excitement…we kept hearing helicopters over our house. 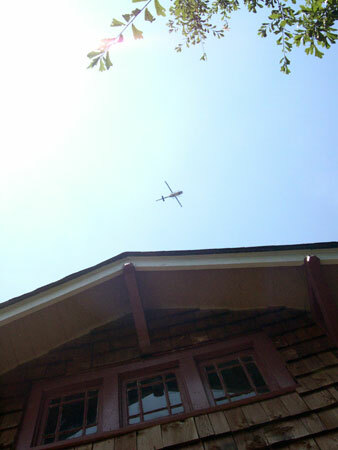 Finally we were curious enough and walked outside to see 2 news choppers hovering right above our house. In the evening news we found out there had been some car chase that ended in a street a block over from our house. The gas company has come out and made a mess of our street. 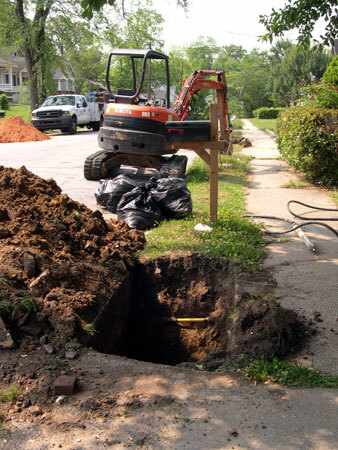 They’re upgrading the gas lines in our neighborhood from 5 lbs. to 57 lbs. of pressure or something crazy like that. This is where they dug up the gas line coming to our house…a couple hours later it was all covered up with dirt again. 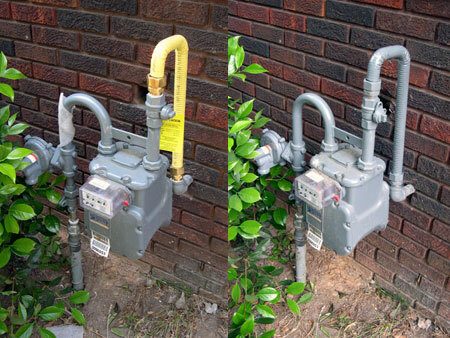 When they changed the pipes at the street they also had to come to the gas meters at the house to upgrade the pipes and some converter there. That included a bright yellow pipe that we weren’t very happy about. After complaining to the workers they told us they would come and paint the yellow pipe. We were about to give up hope when they started working further down the street, but to our surprise we found the pipe painted two days later. And last, but not least, we have also done some work inside the house! 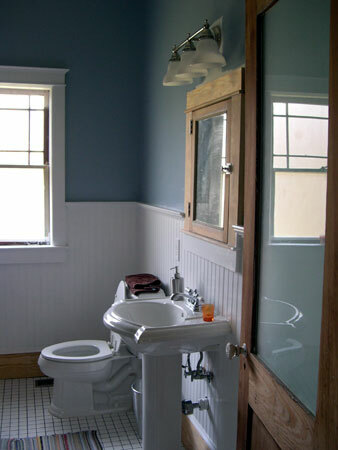 We finally got around to painting the window in the bathroom and a couple of days later the wainscoting. The prep work probably took longer than the actual painting itself. All that caulking and nail hole filling and sanding and refilling nail holes and re-sanding takes up a lot of time. Now we just have to finish painting the base board, which we waited on because we hadn’t caulked that part. It definitely makes a difference in how the bathroom feels. 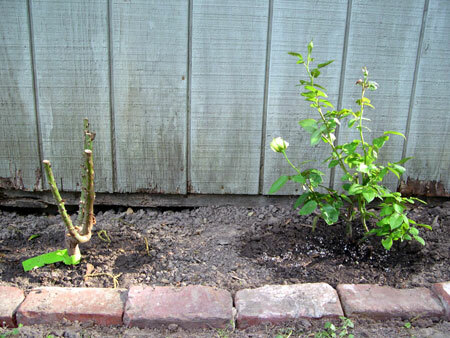 On the left is the Spring Hill Nursery catalog “JFK” rose, on the right is the Lowe’s yellow rose whose name I can’t tell you because Patrick threw away the tag. On the left is the $7.50 rose (after 50% rebate), on the right is the $6.98 rose. I think I’m starting to feel a little bit ripped off with this catalog order. I’ve heard bad things, but I thought it would be good to give it a try nonetheless. Maybe I should have listened. All I know is that rose better make a hell of a recovery and have a hell of an amazing bloom to make up for things. Our little garden buddy. This is the little shy boy from next door. He comes and plays in our yard while we do work, but he usually runs away when you try to have a conversation with him. Our attempt at starting a vegetable garden. In the far back is the grape vine. We’ve had it sitting in our dining room bay window in the plastic container it came in for probably 2 months now. When we bought it there was one tiny leaf. Before we knew it the thing started growing and getting bigger. Now that we put it in the ground the leaves started turning white, so we’re not quite sure what that’s all about. 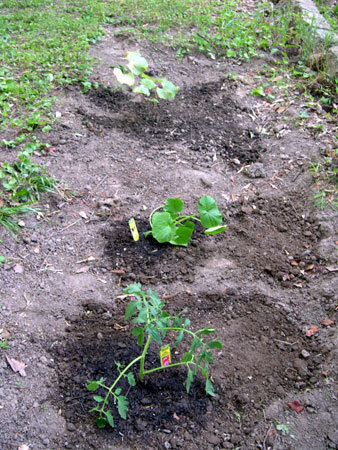 In the middle is a zucchini plant, and in the front a tomato. My parents brought those back for us…hopefully they’ll do better adjusting than the grape has. One of our wishes has been to get two big ol’ flower pots to put by the front steps. 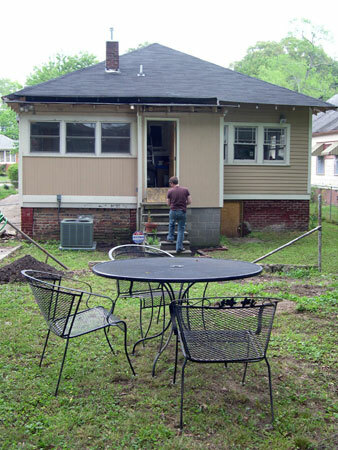 We’ve seen so many bungalow’s with them that we wanted some of our own. On our past searches we’ve only come across concrete or plastic containers – neither of which felt very attractive or otherwise pleasing to us. Yesterday we finally found two glazed clay pots that we liked. It’s funny how such big pots can become so small once you put them next to the big house. 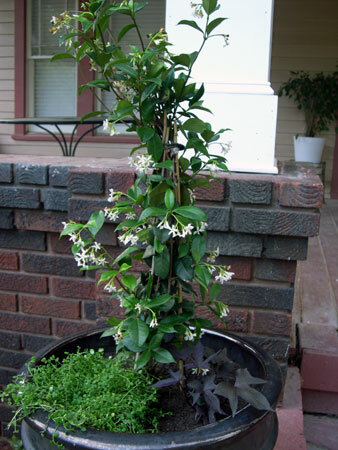 I’ve always been fond of my parent’s jasmine, so when we came across some at Lowe’s I decided that I wanted to put it in the big pots. We bought some little ground covers to go along with it. We haven’t made much progress in the past few weeks. We’ve had a friend in town from Chicago and then my parents were in town for 2 weeks (yay!). So we got to relax and just hang out with friends and family. In addition we’re no longer running the gallery on weekends, so we should have tons of free time to work on and around the house. With the weather getting so nice we seem to have spent more time in the garden than on the interior. 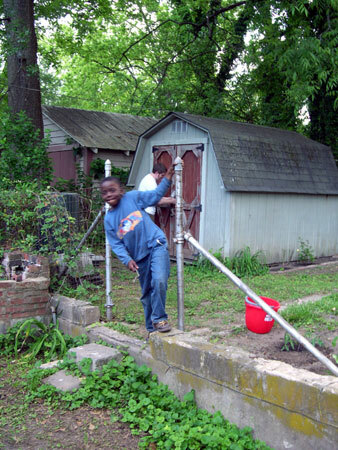 Even though there’s not much of a garden there still seems to be plenty of up keeping work. Our lawn consists of weeds more than grass. I think the most grass we can claim to have is the monkey grass! But the weeds need to be mown nonetheless. In addition to the lawnmower I really think we need to get one of those electrical trimmers to get into the edges. In the meanwhile we tried to order plants from the Spring Hill Nursery catalog. They offered us 50% off, so we would give them a try. The first thing that arrived was a white rose called “JFK”. We planted it next to the shed. The stem was already quite large, but the little bit of growth it had quickly died after we put it in the ground…maybe due to shock? Hopefully it will start to grow before long. Then the next shipment brought the remaining items, including a couple of ornamental grasses (which Patrick is a big fan of), some lavender and some other plants with which we want to attempt to hide the monster of an A/C unit. 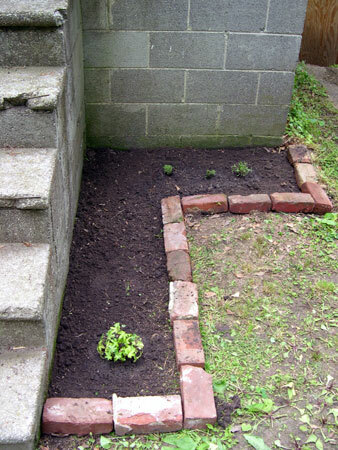 We created a flower bed next to the back steps by recycling the bricks we have dug up from around the yard. The sorry little plants in the back are supposed to be the lavender from Spring Hill. Sadly they look more dead now than they did when they arrived in the box (Patrick’s already given up hope). Hopefully they too will recover, but it definitely isn’t making me want to reorder from a catalog! The other plant closer is one we’ve had in a pot in the loft for a couple of years. We thought we’d try to plant it outside and let it experience the wild, fresh air. Patrick is temporarily putting one of his ornamental grasses in the pot we took the other plant out of. Notice our cute tiny herb garden in the back on the stairs. And lastly we were able to pick up the patio furniture my parents left us behind (which has been stored at Patrick’s mom’s). Patrick’s sister was nice enough to assist us in transporting them over here in her truck. Last night we sat outside for a little while for the first time and just took in our new exterior surrounding. It also made us think about the endless list of things we still have to work on. Hopefully that extra time that we should now have on weekends will really come in handy. Oh, and PS…we went to Lowe’s after work today and bought a number of plants. So hopefully we’ll get to have some fun playing in the dirt tomorrow. And unlike the catalog plants, these don’t look all pathetic and ready to die! PSS…my mom left behind several gardening books. 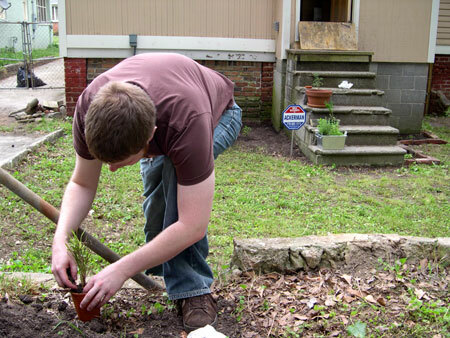 It will definitely help us newbie gardeners to get more familiar with gardening. The Cottage Living subscription that Patrick’s mom gave us for Christmas also arrived yesterday and will give us lots of inspiration. I was already “ohhh-ing” and “awwww-ing” all over the place in jealousy over those gorgeous gardens.